Every Tuesday I select one card and give you my interpretation of it. See how it applies to your life. What messages are here for you? Each Thursday I choose one reader's comment from Intuitive Tuesday and pull an additional card for more clarity...so check back on Thursday to see what cards come up. Today’s card comes from the Legacy of the Divine Tarot by Ciro Marchetti. It is the Queen of Wands, a court card which can symbolize qualities within you, a situation or a person or people in your life. And remember, we all have the traits of ALL four suits. Even though one may be more prominent in our personalities, there are times when we call on each of the suits to help us in our every day lives. As you read the words, notice what images, thoughts, feelings, etc. come up for you. These are your clues to determining the meaning of today's card for you. "She is the Queen who most looks and acts like a movie star: regal, dynamic, glamorous, and commanding. As an idealized personality type, she is warm, energetic, sincere, and has a sparkling personality. She is likely to be intelligent, competitive, and ambitious. By reading the description above, you may have someone who comes to mind. Does this sound like anyone you know (or possibly YOU)? If pulling the Queen of Wands symbolizes a person in your life, what influence does she have on you right now? 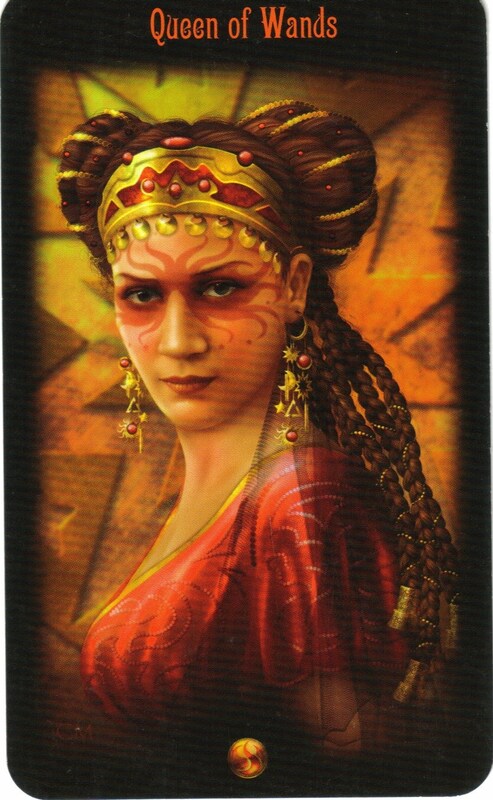 How can you benefit from this woman and her Queen of Wands traits? Is there something here for you to learn? If pulling the Queen of Wands has to do with YOU, where are you exhibiting these traits or possibly where do you need to be exhibiting these traits? For example, if you have been wondering how to create change in your job, pulling the Queen of Wands card today might prompt you to actively and assertively go after what you want. Wands tend to experience and create success in their lives. How can you bring this about? The message for today is to tap into the Queen of Wands energy that is present in your life -- either in another important person or in you. My guess is that you already have a pretty good idea who or what this is referring to. Use your intuition to gain a better understanding of the meanings for you today. If you are like me, this has to do with these Queen of Wands within me. If so, my question to you now is, "What would your life look like if you were to turn up the volume on your Queen of Wands energy?" My image of the Queen of Wands is of her taking me by the hand and saying "let's do this!" I think she is YOU; That Woman in my life! She speaks to me because that exciting, dynamic woman is who I want to be. What I want to know is: how did Mom and Dad manage to raise THREE Queens of Wands?? This is me today. I'm closing in on a big project. Such a big one that I have struggled with not feeling up to it. But I am, dammit. I can fully relate to the Queen of Wands; a woman with those qualities that I strive to reflect every day! This week, the Queen of Wands is me. I'm embarking on a new phase in an old journey; I'm finally feeling "in charge" and ready to make things happen.